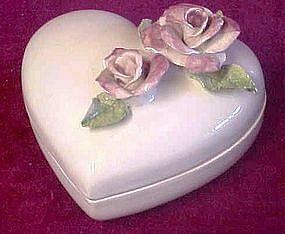 Beautiful hand made vintage heart box is made of ceramic and has hand painted and applied roses. The roses look so realistic and they are perfect. Measures approx 5 1/2" x 5 1/2". Would make a wonderful gift for Valentines day, birthday or Easter.